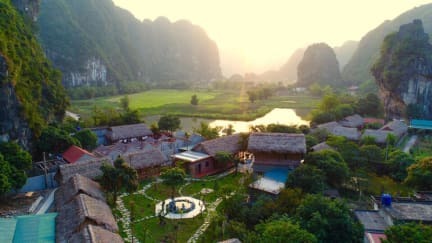 With its unique architecture using environmentally friendly bamboo and bamboo materials, it is easy to find in Vietnam and you will enjoy the feeling of being in a simple life of indigenous people. One of the best places I’ve stayed so far! Such nice staff! They help you with anything and are so kind. Would definitely come back again :) thank you! Really great hostel right by the lake with hammocks, pool, lovely garden, very nice staff. Only downside is that the dorm room is definitely too small for the number of beds in there. Hopefully in the future they can expand the dorm and give a bit more space so it's not so cramped between the beds. But don't let this put you off as it's otherwise a fantastic hostel and very good deal for the price! This place was amazing. 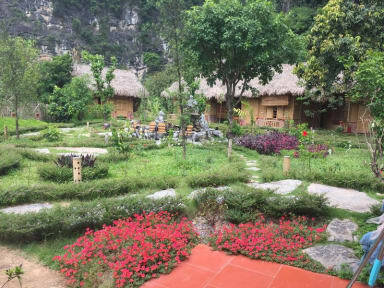 By far the best homestay in the Trang An area. The owners did a great job designing the property. It was very cute, with bamboo cabanas and flowers and fountains throughout. It was right across from the water too so you could sit out on the dock and relax/eat. The room was always clean, and smelled really fresh. The staff was super friendly, helpful and giving. The also had great food. If you want a Ninh Binh speciality, order the sizzling goat. Delicious! I was unwell on the date of arrival. The staff gave me paracetamol and asked my wellbeing the next day. They also offered to change my meal when it didn't suit my taste palette. I really enjoyed my stay with the beautiful river view and attentive staff. Highly recommended!! Such a nice place, the staff is so friendly and helpful. I stayed 3 nights but could have stayed longer cause rhe place itself is magical. It’s a bit more remote from the main attractions than other places, but the sunset views at the river bend are something special. Super friendly staff, wry attentive, great food, and good beer. I missed a bit the socializing aspect, I’ve seen better, but that’s down to us, the visitors. I would go there again next time with no hesitation. Staff was really helpful, facilities clean and most comfortable beds we've tried all around Vietnam. They had some trouble arranging our transfer to Ha Noi though and that was the only drawback -it was supposed to be a comfy limousine but we had to travel in the small front seats.